If you read any words that included "Olympics" on Wednesday afternoon, your viewing last night was a little spoiled. But the Olympics are worth watching even when you know who got gold — because it's not who won, it's how they won. Lindsey Vonn won gold in the women's downhill, bruised shin and all. It takes a special kind of fearlessness to fly down a mountain lashed to a couple sticks, and yesterday's event had enough violent crashes (one skier flew nearly 200 feet before a bouncy, akimbo landing) to thrill even the most bloodlustful NASCAR fan. Women's downhill is simple: You must get to the bottom of the 9,446-foot course faster than anyone else. Vonn made it in 1:44.19, beating her American teammate Julia Mancuso — who took the silver — in just over half a second. These skiers are so in tune with their bodies and their goals that when Vonn crossed the line she collapsed in a joyful heap. She knew she was the fastest. Her mind and body precisely calibrated one minute, 44 seconds, and nineteen tenths of a second. There is something wondrous in that alone. Shani Davis, the defending gold medalist, retained his title in 1,000-meter speed skating. He trains on his own, without a coach. He skates barefaced, unlike his sunglassed competition. His legs are spare and elegant, instead of muscled trunks. Davis was barely panting when he crossed the finish line in 1:08.94, the first man to win consecutive gold medals in this event. We want to watch him do it again, and again, and again. Instead of showing women's double luge (too intimate?) or women's 500-meter short-track speed skating (too interesting? ), NBC opted to air snowboarding, snowboarding, snowboarding, and the men's 5,000-meter speed-skating relay, also known as the Olympic Clown Car. Eight teams comprised of four skaters and a substitute all mill about on the oval. When a skater enters the race, his teammate shoves him off from behind. It is impossible to follow, but highly entertaining to watch. All 42 laps. You know who's way into snowboarding? Cris Collinsworth. If he could do it all over again, he'd abandon his football helmet for the Eddie Vedder plaid and distressed faux jeans ensemble sported by the American snowboarding team. 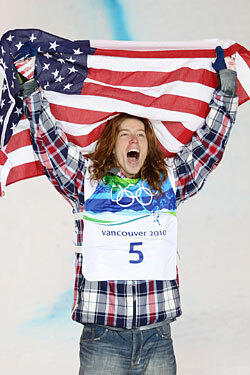 On a Tuesday night "getting to know you" segment, Collinsworth listened with dopey appreciation to Shaun White's tale of taking his Turino gold medal to the dry cleaners after mussing up the ribbon during a night on the town (How do you get bongwater out?). The event's commentators are equally hilarious, mixing traditional analysis with a half-pipe patois, resulting in such lines as, "[This is] one instance in his run where I saw a little bit of sketchiness" and "There's a term that some of use that's called tapping in through the eye of the tiger." White: I can't ride right now, man! Coach: Do whatever you want. Have some fun. What do you want to do? White: I don't know, man. Just ride down the middle? Dude: Nah. Do some airs, man. White: Drop a Double Mc? NBC Commentator: [Abrupt interruption.] We have to apologize for language on the air. Obviously they have a lot of emotions coursing through Shaun White and company. And that, ladies and gentlemen, is why no one wanted snowboarding in the Winter Olympics.